Most country fans would not be expected to know that rapper T.I.’s real name is Clifford Harris, but judging by purchases of 248,000 ringtones and close to 1.98 million downloads of “Dirt Road Anthem,” they certainly know Jason Aldean. So why the comparison? 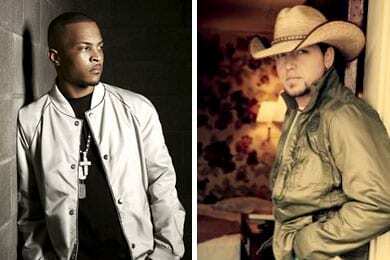 Aldean is in range to beat the all genre ringtone chart record for most consecutive weeks at No. 1 currently held by T.I. The rapper, currently set to be released from prison on Sept. 29, where he is being held for violating parole, holds the title with 18 consecutive weeks at No. 1 on the SoundScan Mastertones Songs chart with his song, “Whatever You like.” Aldean’s “Dirt Road Anthem” is currently in the top spot with 15 weeks at No. 1, a tie with Eminem (“Love The Way You Lie”) and already a record for country music ringtones. What’s causing Aldean’s ringtone phenomenon and is it mostly country consumers or has it spread wider? Parr, who manages Aldean with Clarence Spalding of Spalding Ent. left CMT mid-year 2007 to work with Aldean. Aldean has already set the consecutive weeks at No. 1 record for a country act and he is currently tied in second place with Eminem. However, hot behind him is Lil Wayne who has been in the No. 2 spot for the past three weeks. Can Aldean stay No. 1 this coming week (week ended 9/4/11)? If so he’ll own the No. 2 spot for all genres, with 16 consecutive weeks at No. 1, and be only two weeks away from a tie for No. 1.